Load up with the necessities and go nomad or head for the hills and pick your lines as you prey on the weekend XC brigade. The Vulture is a vicious mix of fat tyre all-road trailblazer, CX monster and distance devouring gravel machine. Lightweight and tough Reynolds 725© heat treated chromoly tubing will conquer those steep poorly surfaced climbs whist agile handling means you’ll enjoy the switchbacks on the way down. We tamed the Vulture just enough that it’ll work with narrow road cranks and big 45c tyres, plus it’s equipped with a tapered 1-1/8th-1.5 inch head tube so you could even fit a tapered carbon fork and race the thing. The Vulture is a versatile beast. The Vulture got 2nd place in Road.cc’s Gravel & Adventure Frameset of the Year 2019 award. Whilst we don’t design bikes with chasing awards in mind, for a small company like Fearless it’s nice to get industry recognition. Chainstays manipulated to clear most chainrings- road 2x up to 53t, road 1x up to 48t. Straight blade butted 4130 CroMo. 404mm A/C with a 47mm offset. Mid-blade rack mounts, threaded eyelets for mudguards and rack. The Vulture is a versatile and tough steel tubed all-road frameset that’s compatible with road drive chains and large volume tyres- up to 700c x 45c/29 x 1.75inch. It comes supplied with the 404, an accurately tracking yet supple 4130 chromoly steel fork. The Vulture’s heavily manipulated 430mm chainstays provide enough room at the rear to accommodate high volume tyres whilst giving the crank clearance required for narrow low Q factor road chainsets. True semi-compact geometry give plenty of standover height when running big tyres without making the rear end too compact and the ride overly harsh. Each frame size has a specific top tube angle meaning we opened up the frame’s triangles where we could so you get nice steel ride compliance and good frame fit. The Vulture’s front end is in the sweet spot between aggressive cyclocross racer and adventure bike. 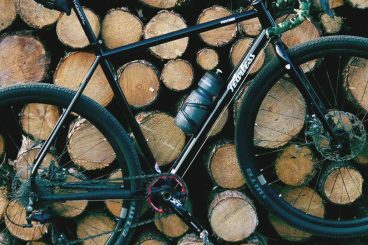 It’s wheelbase is shorter than a typical adventure bike so it’s quick handling but has a taller head tube than a typical CX frame for longer ride comfort. 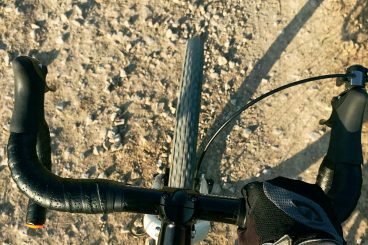 We’ve kept with conventional downtube cable routing with for compatibility and flexibility with drivetrains. 2x and even 3x road set-ups to work seamlessly and the Vulture’s integrated barrel adjusters give the fine tuning required by 11 & 12 speed derailleurs. The barrel adjusters are mounted on the head tube to minimise cable outer length so give a clean and uncluttered routing. 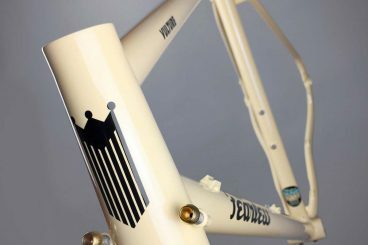 The frame’s main triangle is constructed from Reynolds 725© which is heat treated and double butted thin wall chromoly tubing. The custom drawn 725 down tube is also ovalised at the bottom bracket for lateral stiffness under hard pedalling. For the rear triangle we opted for large diameter 4130 chromoly stays for added strength and lateral stiffness. One of the primary goals with the Vulture was to make a versatile frame that would come equipped with a touring capable fork yet would also accept tapered carbon forks without altering the geometry. To allow this the 404 fork was drawn up with a slightly longer axle to crown length than the norm so when you add the 2-3mm stack height of an internal ‘zero stack’ lower cup, the combined height is the same as a tapered fork fitted with an external 44mm (S.H.I.S: EC44/40) lower cup. The Vulture will accept a tapered fork with an A/C length of around 394-397mm meaning the Vulture frame is compatible with the latest tapered carbon CX and gravel disc forks. We spec’d the 404 with an offset of 47mm to keep the Vulture nimble when running big tyres. Large volume tyres tame poor surfaces with only a minor increase in contact patch and current designs are fast rolling and lightweight. If you’re planning to swap out the 404 for a tapered carbon disc fork then check it’s offset measurement- the Vulture frame handles great with forks that have an offset between 47-50mm though you intend to run mostly road tyres smaller than 35c, 45mm offset forks work well too. The 404 is laterally precise, supple where it counts plus it’s E.D coated and finished with tough powder coat paint. On one level the Vulture is a sensibly designed steel frame & fork but when you add grippy off-road tyres it becomes a fast drop bar off-road fun machine that gives access to routes and trails that were previously out of bounds. If you have any questions then please check the Vulture FAQ. If you’d like to purchase a Vulture frameset then you can do so on the ordering page.